adidas king of the road 2008: prepped or pepped? it has been nearly a year since i last participated in a road race, the last one being in preparation for my mount apo climb in late november last year. i recall, with vivid detail how i bucked sidestitch and a number of pains radiating from many points along the length of my enormous legs to finish 10km in slightly over 58 minutes. it was a proud personal moment considering i hadn't had any serious training previously, and that my last long run just prior to that -- the now ignominious new balance 25km killer at clark which i finished in over 3 hours after a serious bout of cramps past the 14km mark -- nearly left me disabled. but the last two of my 10k's have been been impressive, only that i had accomplished them a long time ago. i actually don't know why i haven't been an active participant in the many road races that are scheduled each month, and i've been generally lazy to lace on my running shoes to hit the treadmill or the asphalt for a minimum of 30 minutes. my state of fitness has so plummeted that there came a time i had to walk in between a 4km cardio workout. that was a little over 2 months ago, and after nearly hitting 168lbs again, i resolved not just to lose weight, but to pick up my speed and stamina. i signed up for the 21km category of the singapore standard chartered marathon slated this december, and i've been training, albeit aimlessly. and this perhaps is the reason why i was lackluster last saturday for the adidas KOTR. my preparations for my first 10k of the year were superficial: i bought the most recent pair of adidas running shoes as well as a very breezy pair of adidas running shorts and even a nice post-workout adidas shirt with an oddly-placed zipper. i ran, mostly on the treadmill, and a few times around velasquez park, doing a steady pace of about 5'50" to a kilometer, and covering distances of about 5kms, often less. the longest run i had prior to last saturday was 3 rounds of the academic oval at UP, which is only 6.6kms. and none of my practice runs ever had sun in them. so although i looked forward to the adidas king of the road, and had personal goals for myself, i knew that it would be a huge challenge. at 5am, ryan scooped me at the corner of tordesillas and buendia. markers had already been placed on the innermost lane for the runners, which ballooned to over 5,000. at 5:30am, while a beautiful dawn was breaking over the rooftops of serendra, and after the 21k runners were off, we filed into the starting line. my ears were plugged into my iPod nano, and my recently-calibrated nike+ was attached to my shoes. just before 6am, we were off. i started steady, focused really on just maintaining 6' per kilometer, with occasional gusts of speed in the hope of finishing below 60 minutes. when we went up the flyover, i didn't slow down, even as i saw the leading runners of the 21k pass us by. i was doing good, so i thought, and was pleased to find other lawyers running: nicky ty, john virgino, to name a few. i also had so many friends going the other direction, and i cheered them on. i had to stop though at the foot of the flyover to tie my shoelaces, but i picked up my pace and continued till the turnaround at reposo. it was then that i began to entertain thoughts of stopping. the sun made a direct hit on our faces and i felt ill at ease. i could sense a distraction developing on the sole of my feet: a blister was forming. damn shoes. going up the flyover, i slowed down a lot. it looked like i was running, but it really was a trot. then a number of pains, like nerves and veins pressed against bone, began to surface, and i had to walk for about 100 meters just before getting down at ground level. i ran again, but had to walk again in front of net one center all the way to the fort strip. i found my second wind just before the NBC tent and it was a sprint to the finish line. i took one final glance at the official time before crossing the finish line, and it was 1'03'57". i ended my workout a bit later, and my iPod and nike+ recorded 1'04'03". all in all, it was a good run, although i felt hugely disappointed that i couldn't sustain my pace, and that i caved in to the distractions of these little nagging pains. i was unable to break through the psychological barrier: since i haven't done anything beyond 7k this year and since i've never had sun exposure in any of my runs, i basically slowed down when i reached 8k. i really have to improve on my runs in time for the singapore standard chartered marathon. it would be a dream to finish it in 2 hours. that's a lofty goal. di ko kaya tumakbo sa marathon. Inside two hours? Ano ka, Drew Arellano? Ha ha. 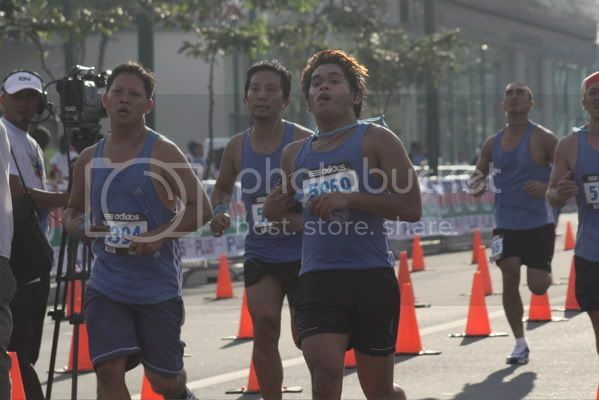 Based on the KOTR official results, most AMCI guys would flunk it if they ran the UPLB 15K again. pops, sabi nga ni casey kasem: keep reaching for the stars. if you fall, you'd land on the moon. parang ganun. 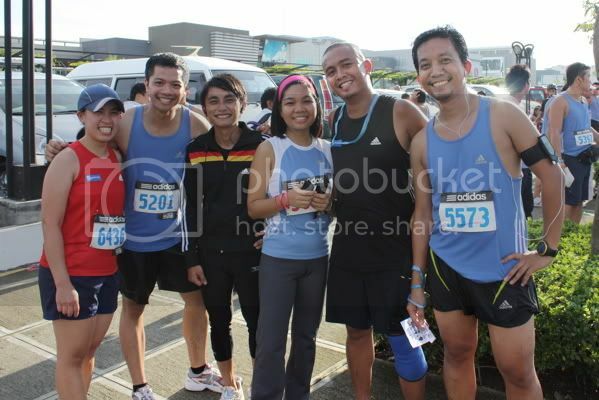 and i don't think kasama ako dyan sa "most AMCI guys", kasi even with a 6:26 pace, i'd still finish 15k under two hours. i'll sue adidas for its inaccuracy. dapat naka-RFID! leche. Pwede ka na sa IC ano? Join ka na. Pulag via Tawangan-Akiki traverse. tawangan na lang ang hindi ko pa nagagawa sa pulag. but i can't do that induction. too many days off from work. besides, i couldn't really care less. P.S.- good luck in Singapore!!!!! !